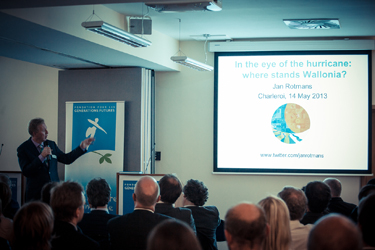 Prof. Jan Rotmans is internationally renowned for his pionneering work in the field of economic transitions management towards sustainable development and system innovations. In an inspiring conference on tomorrow's industry, he will address the issues of regional economic transition management towards a sustainable industry and economy: how to relocalize talents, develop new skills and integrate social and environmental impacts of the economy. He will illustrate his case with examples, a.o. successes from the ongoing economic transition in Finland. This invitation-only conference was geared toward CEOs, top executives and Presidents.